On September 8th the Church celebrates the feast of the birthday of Mary, our Blessed Mother. Tradition tells us that Mary was the daughter of Saints Joachim and Anne. She was betrothed to and later married Joseph, a respected Jewish carpenter from Nazareth. Little is known of Mary’s life other than the references to her in the Gospels. She attended the wedding feast at Cana, was present at Jesus’ crucifixion, and was with the Apostles at the coming of the Holy Spirit on Pentecost. We give praise to our Blessed Mother today. We celebrate her being the new Temple, the pristine Tabernacle, our Virgin Mother, who gave birth to our Redeemer. Mary, through her life, gave witness to the true meaning of trust and charity. Father Joseph R. Upton, the chaplain for The Fra Angelico Institute for the Sacred Arts and assistant pastor in my parish, mentioned in a sermon a few years ago that three births are celebrated in the Church’s calendar: John the Baptist, Mary, and Jesus. All three of these people were devout Jews. It is through them, and their understanding of trust and charity, that we can see that the Jewish people have always been a people who truly love God. Their love expresses a deep sense of trust, because in love we see that their devotion is based on the virtues of faith and hope which expresses itself in word and deed. Fr. Upton went on to say, “Mary is the bridge” that allows not only the Jewish people, but all people, to see that God has fulfilled the promise that He made to their ancestors. Mary, our Blessed Mother, enables that promise of redemption to be fulfilled through her “Yes” to the invitation to be the spouse of the Holy Spirit, which enabled the birth of her Son, Jesus to occur. Mary’s personal qualities of simplicity, humility, love, faith, and hope combined into a dynamic personality who, as she grew to adulthood, betrothal, and marriage to Joseph, enabled her to exemplify to all generations the meaning of a life that is full of grace. We must remember that Catholics do not worship Mary. Worship is reserved for God alone. The Latin or Western Rite (Roman Catholics and those Eastern Rite churches in union with Rome), and the Eastern Rites (Orthodox churches) pay respect and reverence to Mary but never worship her. We pay special reverence to her because, she as the mother of the Redeemer, deserves that respect and honor. We also acknowledge her in a special way because Mary intercedes (pleads for mercy on behalf of the Church) before the throne of God in the same way that a mother would intercede with the father on behalf of her children. Thank you Blessed Mother for all you have done for us – and – Happy Birthday! You need to be very careful when you use these terms. First, the Bibles that I traditionally use are the Douay Rheims(Confraternity of Christian Doctrine) translation based on the Latin Vulgate and ancient languages, the Revised Standard Version (Catholic Edition), the New American Bible (Catholic Edition), and The Jerusalem Bible. These Bibles are based on the Latin Vulgate, yet through the centuries different translation have attempted to improve the language, and clarify meaning, as a result of scholarship and study. These Bibles are all in agreement with saying that Mary was betrothed to Joseph. At the time of Jesus, Mary, and Joseph betrothal meant that the future husband would go to the father of his future wife and ask for his blessing on their marriage. This was a limited legal agreement. If the father agreed then a date would be set with the rabbi for the formal marriage. At that time in Galilee, the normal period of betrothal was one year. At the end of the one year period the formal marriage would take place. So from a Jewish legal point of view the marriage would have eventually taken place. The period of confusion that Joseph went through and the calming of his mind by the visitation by the angel, eventually allowed the normal procedure of betrothal to be followed and ended any speculation in Joseph’s mind to turn Mary over to the religious authorities for punishment because she was pregnant. Joseph was a “just” man, he ultimately understood that Mary would be stoned to death because of what he initially and naturally thought was her indiscretion. But, the angel calmed his mind, allowed him to understand in a limited way what was going on, and to proceed on to the marriage. Let’s remember Catholic teaching: Mary is the spouse of the Holy Spirit. It was the will of the Father that she would be spiritually wed to the Holy Spirit, as the New Eve. She becomes pregnant with the Son of God – the promised Messiah – through the indwelling of the Holy Spirit within her. When was Mary invited to be the spouse of the Holy Spirit? Mary was betrothed to Joseph only. Chapter 8 of the Dogmatic Constitution of the Church, The Catechism of the Catholic Church, and our Holy Scriptures, specifically the Gospel of Luke (1: 26-38), speak of this invitation. You see, implied in the angel’s words is an invitation. An invitation to be the Mother of the Redeemer. There is a choice in his declaration. Mary is pure and full of grace, yet, she still has free will and reason. Thus, she can intellectually understand that this demands a response from her – she has to make a decision in response to the angel’s invitation. That is the key sentence; for in that sentence you have Mary’s response to the invitation. She has said “Yes!” As a result of her choice, and the subsequent birth, ministry, death, and resurrection of her Son – we are redeemed – and can choose for ourselves on whether or not we want to be part of His Church. Our God does not want robots. He wants us to freely choose Him. He has given us the intelligence, will, reason, and logic to make the decision. So the invitation is always there for us, like it was at that historic moment for Mary. We are allowed to freely choose Him every day until the moment of our death. 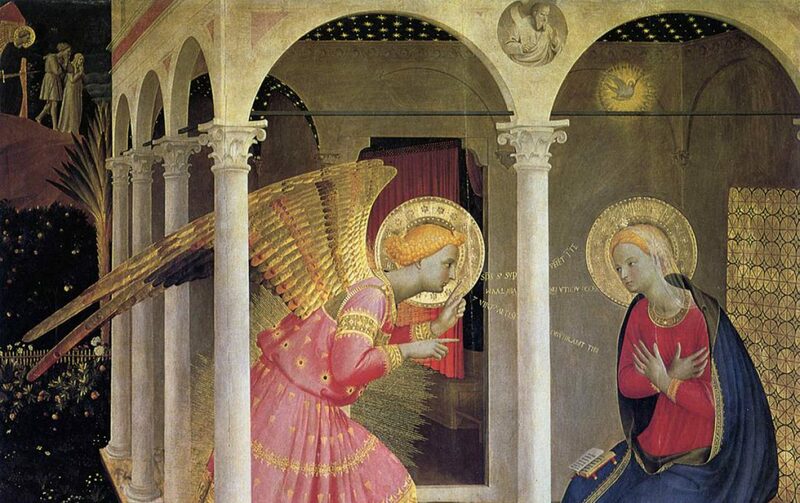 The angel’s invitation to Mary was not to be a “spouse” of the Holy Spirit but to be the Mother of God. She was told by the angel that she had found favor with God and was to bear His Son. Her “yes” was her affirmation of being a “handmaid of the Lord” which, as a consecrated virgin, we know she already was! Joseph, an older man and a widower, was to be her (and Christ’s) caregiver and protector only. In those days, this was a common practice. Where is there evidence that Mary was “wed to the Holy Spirit?” She was wed to Joseph, but remained a consecrated virgin forever. I will be posting another article on exactly this issue later on tonight it might answer some of your concerns – especially about the “evidence.” Peace. Another reason to thank our Lord. The beautiful gift of His Mother, who prays for us and intercedes for us. Thank You , Jesus! This is an excellent post my friend. Most non-Catholics like myself believes Catholics worship Mary. At one point in my life, I thought so too. Thanks for the comment. I am glad that you understand that we do not worship Mary, but, we do pay her great respect for her choice to be the Theotokos – the Mother of God. Details, history and fascinating facts. Just letting you know that I’m re-blogging your post. That was a particularly interesting paragraph about the language of the Angel Gabriel’s greeting to Mary. I had never heard any of that before. I learn so much here! Thank you. Thanks very much for your support and kind words. Please keep us in your prayers. Thanks for rebloging my post!